Lifetime, the king of the miniseries, is working on one about Coco Chanel and Shirley MacLaine will play the inimitable fashion icon in her later years, as she set out to re-establish her reputation as a fashion trendsetter and mysterious Slovakian born Italian film actress Barbora Bobulova will play Coco in her younger years. The 2-part miniseries will run in early 2008 on Lifetime. Italian screenwriter Enrico Medioli penned the script, which follows the rise of Chanel, starting with her upbringing in an orphanage outside Paris. The series actually begins with Chanel's move to reinvent herself in her 70's, after spending years in exile. Canadian made-for-TV-movie czar Christian Duguay will direct. And Duguay says he was intrigued by the story of Chanel, but didn't want to simply make a long form about fashion. "We've worked hard with it, and turned it into something that is meaningful and worth making an event miniseries," he said. "There's no point in doing it if it won't educate people and entertain, but in an original way. It's a love story, it's a rags-to-riches story, it has some strong social statements about women and about how the world has changed." Apparently, Chanel's Karl Lagerfeld has even given his blessing to the miniseries; the famed design house is will work closely with the production to get things right. For example, costume designer Stefano de Nardis, he did "Gangs of New York", is working with the House of Chanel to recreate Coco Chanel's designs for the film. Coco Chanel was born Gabrielle Bonheur Chanel in August of 1883. 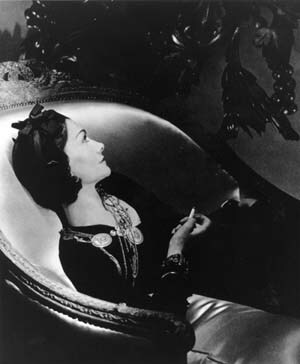 A pioneering French fashion designer whose modernist philosophy, menswear-inspired fashions, and pursuit of expensive simplicity made her arguably the most important figure in the history of 20th-century fashion, her influence on haute couture was such that she was the only person in the field to be named on TIME Magazine's 100 most influential people of the 20th century. Coco died in January of 1971. A gorgeous Staffordshire Bull Terrier named Coco Chanel. I wanna watch this movie..must be great!